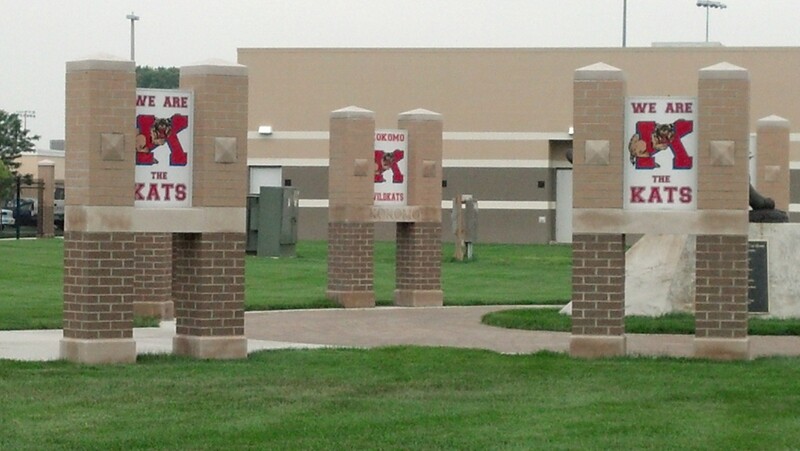 Kokomo High School has already removed the New Castle logo from the entrance to Walter Cross Field. A KHS logo stands in the place of the former NC logo. The following is a press release from the North Central Conference, issued at 1:16 p.m. on Aug. 23. The North Central Conference schools consisting of Anderson, Huntington North, Kokomo, Logansport, Marion, Muncie Central, and Richmond, along with New Castle, met with the IHSAA Commissioner on Friday, August 23, 2013. As a result of that meeting, and in the best interest of the student athletes and communities of the North Central Conference and New Castle, the NCC Schools and New Castle will void all current and future NCC Conference Dates (excluding Football for the 2013 season). NCC Schools wishing to schedule New Castle may do so on a school-by-school basis. The North Central Conference looks forward to a new era with its current membership and the addition of Lafayette Jeff, Harrison, and McCutcheon High Schools. The NCC would also like to wish New Castle the best of luck as they begin a new chapter in the Hoosier Heritage Conference. For the Publisher Dean Hockney’s take on this announcement and the NCC in general, see next weeks edition of the Sports Journal. This entry was posted in IHSAA, Kokomo, North Central Conference. Bookmark the permalink.